The announcement two weeks ago of Dynamics 365 at Microsoft’s World Wide Partner Conference (WPC 2016) in Toronto has taken a lot of the market by surprise, created a lot of interest, but also driven a clamour for more information and guidance. What content there is so far seems mainly to have been aimed at business leaders – there isn’t a lot of detail out there at the moment; if you’d like to know a little more, Dynamics 365 is one of the topics which will be addressed in 365 Talent Portal and Microsoft USA‘s web update next Friday July 29 at 10 am PST, 1pm EST. Details, and how to join, are here. Below is my perspective on what we know so far of this exciting new direction. What is the grand plan? From most perspectives, Microsoft has been lagging badly in the CRM wars. According to Gartner in May 2015, it currently has around 6% of the market; Salesforce apparently has just over 18% and both Oracle and SAP have around 9% and 12% respectively mainly by selling into their own ERP base. Microsoft has done well in selling its software to new and smaller CRM users, but needed a sea change in strategy to start to address the gap between it and its rivals in the larger enterprise space. We’ve already learned Microsoft and Salesforce became dancing partners and potential suitors last year (apparently they couldn’t agree whether the size of the dowry should be $55B or $70B), but have since remained close, partnering in the business application space such as with Lightning for Outlook. However, it seems something bigger is needed, hence the announcement of Dynamics 365, AppSource and a host of associated tools and products. 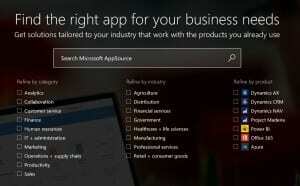 Briefly, what is Dynamics 365? Microsoft Dynamics 365 is a new cloud service which is slated for first release prior to Christmas 2016. At the highest level, it is a combination of Microsoft’s CRM and ERP products, but it goes much further than that. For a start, it has a single common data model (CDM) – see below for the implications of that. For another thing, the service also combines many of Microsoft’s other products such as Office, Cortana, and advanced analytics, with the idea of bringing together business process and business productivity. And for one last thing (at least in this blog), it offers what Microsoft believes is a revolutionary new way to allow users to buy what they need. What does this mean for the current Dynamics products? Dynamics 365 includes two current Dynamics products – Dynamics CRM and Dynamics AX. However, AX is not suited for every organisation’s ERP need, and so Dynamics 365 will also include Project Madeira, the cloud ERP system for SMBs, to be known as Dynamics 365 Financials for Business. The other products in the Microsoft ERP stable, Dynamics GP, NAV, and SL, are not expected to feature in Dynamics 365 and will remain standalone products with their own roadmaps, so Microsoft told partners at WPC 2016. So how will AX and CRM contribute to Dynamics 365? Mike Ehrenberg, Microsoft Technical Fellow and Leader of Dynamics R&D, explained that initial Dynamics 365 functions will be based on existing capabilities of Dynamics AX and CRM, as well as Project Madeira: “The Dynamics 365 approach will be driven primarily by re-packaging and, to an extent, re-architecting, the capabilities of Dynamics CRM, AX, and Project Madeira,” he said. “This alternate approach will require new deployment and data management capabilities. We understand Dynamics 365 is something that makes a ton of sense for customers but only with product truth behind it,” he explained. Quite what those new deployment and data management capabilities will be, and who is expected to provide them, will hopefully become clear soon. Rather than buying products or suites, and adding on individual components, with Dynamics 365 Microsoft plans to allow customers to purchase products based on their job role. So instead of thinking of needing CRM or ERP or Office groups of functions, or certain parts of each, customers will be able to buy a service that fits the various job titles of the users that need it. That sounds attractively simple, and the fact that Microsoft will have prebuilt the plumbing to make it all work together should make it easier for customers to purchase and understand, and easier for partners to sell. However, it also presupposes that Microsoft fully understands exactly what a sales manager needs, compared to a marketing manager. Plus how to address the variances in need: for instance, two individuals from say, a Pharma company and a small financial institution may share a job title but their need for information and how they process it are likely to be vastly different. There are also clear divergences in this area imposed by culture even between countries with apparently similar outlooks such as the US, UK, and EU countries; some like a lot more detail to work with, or the ability to add a little discretion to a defined process, than others. But Microsoft are confident the new model will work. “Our role-based approach will give customers the flexibility they need to support modern, more agile, more diverse employee roles,” said Jujhar Singh, corporate vice president of Microsoft Dynamics CRM, in a blog published just as the announcements were being made. But just to be on the safe side, he also stressed that the traditional licensing approach by application will still be available. 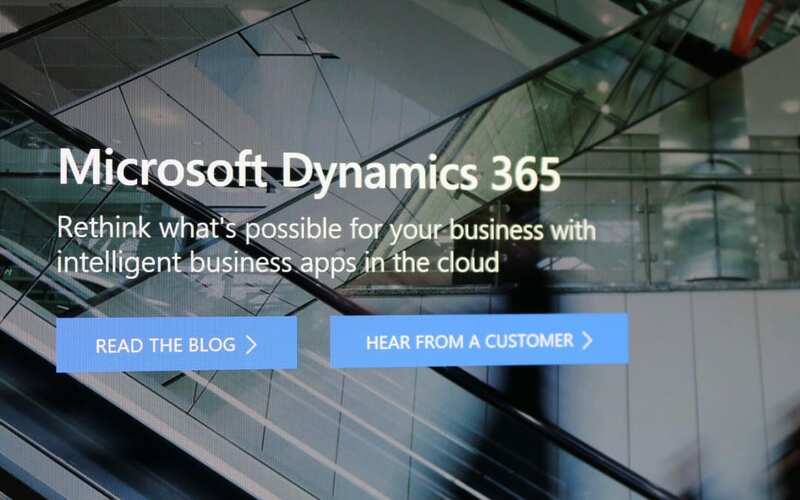 Microsoft has announced that Dynamics 365 would include “a common data model, shared with Office 365, to simplify data management and integration across apps and business processes.” A common database and common data structure sounds a progressive and eminently sensible way to provide integration so customers wouldn’t need to worry about creating or maintaining complex integration – and this is also something Salesforce currently doesn’t have. However, let’s for a moment look past the clear business advantages to the actual words, “a common data model, shared with Office 365”. None of my friends at Information Management Group (IMGROUP) that specialise in Office 365 knew of something called a Common Data Model, and it doesn’t exist in Dynamics, so it must be something that will be freshly applied across all of these products. In fact, CDM has come out of Microsoft PowerApps. 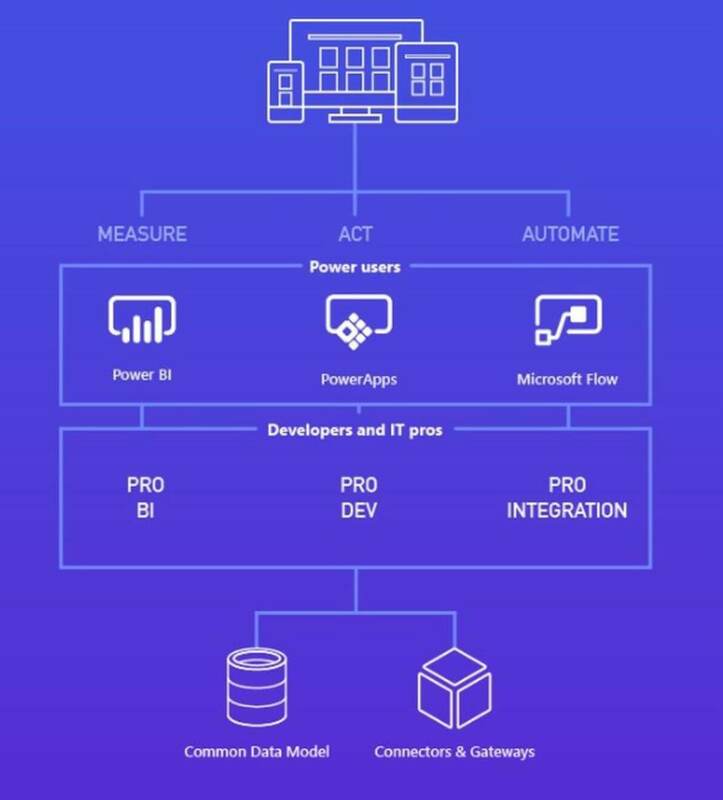 PowerApps is a service for building and using custom business apps that connect to data and work across the web and mobile – without the time and expense of custom software development. It includes a host of out-of-the-box connectors to store data on SQL, Dropbox, SharePoint and many other platforms. 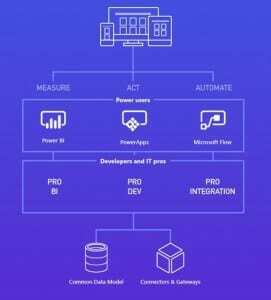 As Karthik Bharathy, Principal Program Manager, PowerApps, explained in his blog of 11th July, 2016, CDM is “an out-of-the-box business database for storing and managing business entities” …… “comprising of well-formed standard business entities that can be deployed for use in your organization”. It is intended to help organisations avoid the problem where the “quickly run into silos of information, missing out on a unified view across apps. With CDM, enterprises can improve operational efficiency with a unified view of business data.” He also says it will undoubtedly prove a very attractive platform for an enormous number of ISVs to build applications for – more of this just below. A common platform across CRM and ERP has many advantages. But those of us that remember a previous Microsoft ERP convergence plan called ‘Project Green’ will be very interested to see how CDM progresses. It sounds like it has got a long way further already – a preview is planned for shipping in August. So, technical help and unified platforms aside, how will Microsoft help those ISVs bring their products to market? 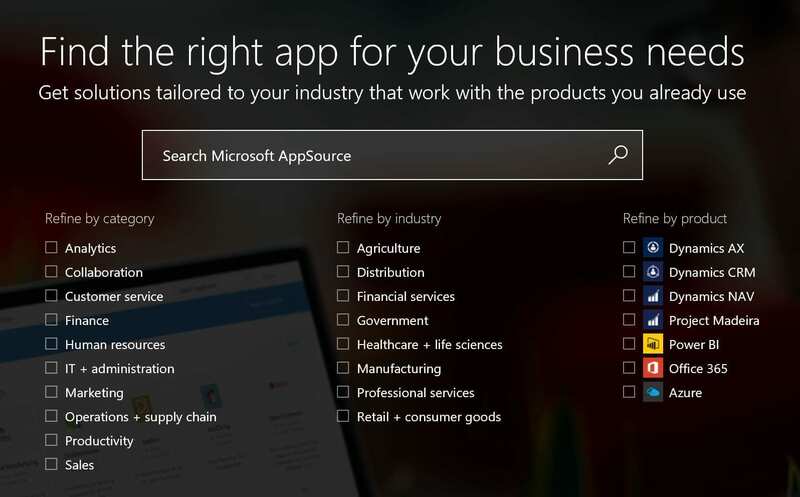 Well, in line with strategy from firms like Salesforce, Microsoft has also launched AppSource, which is a marketplace for SaaS apps which can be bought and integrated directly into Microsoft Dynamics 365. Microsoft believes this will turn into a $57B opportunity by 2019. Perhaps learning from the mistakes of Windows Phone, where low market share and technical differences dictated that most apps were and are developed only for iPhone and Android, Microsoft is taking considerable effort to encourage the ISV community to populate AppSource with industry-specific applications as well as smaller horizontal or functional widgets. There are already 200 applications in AppSource, developed by early adopters of the program. Apps will be surfaced within the various Microsoft products including PowerBI so that contextually correct apps can be quickly found and incorporated into the overall solution. What does this mean for Microsoft consultants and partners? There is no doubt that this new direction looks like a game changer. It does, however, throw up some interesting questions. For instance, Microsoft’s Dynamics products are supplied, customised, and supported by the partner channel. Many of those partners specialise only in CRM or in ERP, but rarely both. Even if Dynamics 365 removed the technical differences between CRM and ERP, successful projects demand that partners can add value by understanding their market intimately – and many simply do not have the spread of knowledge. Perhaps we should expect to see a flurry of partnerships, mergers, and acquisitions. Watch this space. Detail is scarce at the moment but this is certainly an interesting new direction for Microsoft’s business applications, as well as a potential redirection for the whole business solution market. Microsoft’s consolidation of CRM and ERP clouds, with prebuilt integration of apps and the ‘classic’ products, could fundamentally change how customers use the applications, if Microsoft can actually deliver on the common data model it outlined. The role-based licensing model certainly can change how customers pay for the service they require. Pricing for Microsoft Dynamics 365 hasn’t yet been released, but the service is expected to be available prior to Christmas 2016. Further information: to find out more about Dynamics 365 and CRM Spring Wave 2016, please join 365 Talent Portal and Microsoft USA’s web update next Friday July 29 at 10 am PST, 1pm EST. Details and how to join are here. About us: 365 Talent Portal is the first online platform that gives Microsoft Dynamics partners and end-users instant access to thousands of skilled, certified independent consultants. With a network spanning 114 countries, it allows companies to search for consultants based on their skills, rates and available dates, enabling them to find the best person for their projects without incurring the hefty fees typical of recruitment agencies. To find and hire excellent Dynamics resource, please register here –www.365talentportal.com.